What strikes me from the tips compiled by Michele McGovern, would anyone want to be tagged as a 'cold calling expert' in 2018? Cold calling no matter how you dress it up is what it is - cold. You can trawl through Google and social media as much as you like but if you don't know the person you are calling and they don't know you - it's a cold call. What's more, it's intrusive, interrupting, unwanted and makes you come across as a struggling salesperson from a company struggling to make sales. The smart sales people are social selling - disappearing into the distance as you keep ringing everyone back. We are not in the 1990's - the last decade when cold calling was widely acceptable. Times change and it seems the majority approached for the article, were rounded up because they wouldn't question how old fashioned and out of date cold calling is. Or because they would just say what sales trainers, 'gurus and experts' have been banging on about since they first got into sales - because it;s all they know. Assuming they have actually had a career in sales. 'Act like a champion, raise your arms above your head and assume the Victory position'. - What? Cold calling sends a cold shiver down most salespeople’s spines. Probably because it evokes a cold shoulder from most prospects. 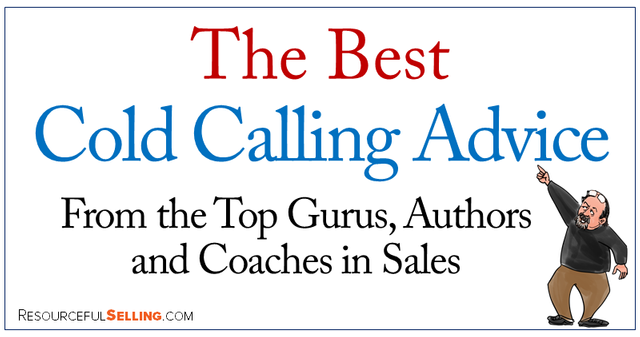 But experts agree: There are ways to be successful at cold calling. To help salespeople successfully cold call, we put some of the top experts in the sales industry to task. We asked them to share their best cold calling advice, proven techniques and strongest strategies.